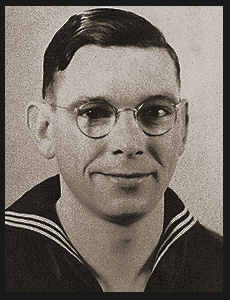 BM 2/c Myers J. Faulkner, son of Mrs. Edna A. Faulkner, graduated from Manitou High School; husband of the former Meg Loftis. Entered the Seabees in Nov., 1943, trained in Norfolk, Va., Port Hueneme, Cal. ; served in Adak.